A few weeks ago my trusty Samsung Galaxy Note 4 started acting weird, randomly rebooting at inopportune times. To make a long story short, on the second trip to a Sprint store the technicians determined that it was a hardware problem. Since Sprint has no more Note 4 units available for replacements, their only alternative was to upgrade me to a Note 5. Ever since the Note 5 was announced, I didn’t want it. The Note 5 has no removable battery, and no Micro SD card slot. My plan was to keep the Note 4 and skip to the generation after the Note 5 that should be released sometime towards the fall of this year. The free upgrade to the Note 5 does not affect the plan I’m on – I can still upgrade to the new Note (6 or 7, depending on what Samsung decides to call it) when it comes out. I was stuck, so I took the free upgrade. Even though I was somewhat prejudiced against the Note 5, I have to say I’ve been quite impressed with it. The upgrade in overall performance and the snappy feeling of the device is tremendous. The other thing I’ve been amazed with is excellent battery life, which happens in spite of the improved performance over the Note 4. The overall size of the Note 5 is physically smaller than its predecessor, yet it retains the 5.7” inch screen size. Samsung was able to achieve this by shrinking the bezels even further, particularly on the sides. For some time now I’ve been using my phones to scan documents for work. I started doing this with a Galaxy S3. The process was faster with the Note 4. It flies with the Note 5. My bank recently sent me a new chipped debit card, so I had to go through the process of logging in to various services to update my information. To my surprise, I was able to efficiently do all of this updating via the Note 5, mostly due to its speed and responsiveness. Are there things a mobile device can’t do? Of course. For one thing, a 5.7” inch screen is too small for many tasks. 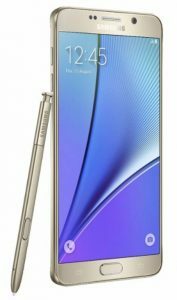 Could I type out an article or record and upload a podcast on the Note 5? Yes, but the mobile form factor just doesn’t work well for these sorts of tasks – they cry out for a real computer in order to be carried out quickly and efficiently. Smartphones have matured, yet there remains room for improvement. In my opinion, improved performance and improved battery life are the two biggest things that will induce me to consider upgrading to a new phone. Improved camera performance is always a nice thing to have, but camera performance alone won’t induce me to pull the upgrade trigger. Styling and silly emotional gimmicks have diminishing appeal in a mature market.